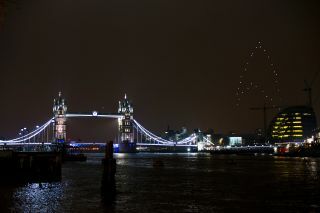 Another view of the "Star Trek" logo in the London skies, which a fleet of drones created on March 23, 2013 to mark "Earth hour" and promote the upcoming film "Star Trek: Into Darkness." London's iconic Tower Bridge is at left. A fleet of tiny drones formed the "Star Trek" logo in the skies over London Saturday night (March 23), giving the world a sneak peek at a future in which unmanned aircraft are put to all sorts of commercial use. Saturday's light show involved 30 miniature four-rotor "quadcopters," which hovered in formation to generate a 300-foot-tall (90 meters) version of the famous Trek logo. The purpose was twofold — to promote the upcoming film "Star Trek: Into Darkness" and raise awareness about the need to take action on climate change. Drones remain a rare sight in most people's skies, as unmanned aerial vehicles are still used primarily by governments for military and surveillance purposes. The U.S., for example, has employed the remotely piloted Predator extensively in combat zones such as Afghanistan and Iraq. But things will likely change greatly in September 2015, when the U.S. Federal Aviation Administration (FAA) is slated to lift its ban on the commercial use of unmanned aircraft. Drones have applications in a wide variety of fields, from agriculture (farmers can use them to monitor their crops) to filmmaking (camera-equipped quadcopters or similar bantam craft can capture killer footage on the cheap). The "Star Trek" logo lights up the London skyline on March 23, 2013 to mark "Earth hour" and promote the upcoming film "Star Trek: Into Darkness." So the floodgates appear primed to open. FAA officials certainly think so, predicting recently that there could be 10,000 commercial drones buzzing through American skies by the year 2020, gathering and storing photos, videos and a variety of scientific data. This prospect is likely unnerving to many people who hold their privacy dear. Indeed, the Electronic Frontier Foundation (EFF), a nonprofit digital-rights organization, has already begun filing lawsuits to get the FAA to release information about drone-license applicants. Eighty-two public entities asked for permission to fly unmanned aerial vehicles over the U.S. homeland prior to October 2012, according to the EFF. It may be tougher to keep track of who's flying what in just a couple of years.